Beto O'Rourke enjoyed strong support from tech industry workers and executives from companies such as Apple, Facebook and Amazon during his ultimately unsuccessful U.S. Senate campaign last year in Texas. That could mean a boost for the breakout Democratic star's fundraising hopes as he seeks to challenge President Donald Trump in 2020. Yet, it will likely be a point of contention for the new campaign. O'Rourke and several of his Democratic rivals have made it a point to distance themselves from corporate money. Beto O'Rourke, former Representative from Texas and 2020 Democratic presidential candidate, shakes hands with an attendee during a campaign stop in Mount Pleasant, Iowa, U.S., on Friday, March 15, 2019. Beto O'Rourke enjoyed strong support from tech industry workers and executives during his ultimately unsuccessful U.S. Senate campaign last year in Texas, which could give the breakout Democratic star a fundraising edge over his primary opponents as he seeks to challenge President Donald Trump in 2020. Yet, it will likely be a point of contention for the new campaign. O'Rourke – who announced Monday that he raked in a record $6.1 million in the first 24 hours of his 2020 campaign – and several of his Democratic rivals have made it a point to distance themselves from corporate money. Likewise, perceived coziness with big tech could pose political risks with rising bipartisan calls to crack down on and regulate the industry. During his shockingly close loss to Republican Sen. Ted Cruz in deep red Texas, O'Rourke raised tens of millions of dollars, much of it from so-called small donors, or people who give $200 or less. As the Democratic former congressman touted his success among smaller donors, while rejecting money from corporations and super PACs, he also reaped the benefits from bigger-dollar donors, such as executives and employees from major tech companies such as Apple, Facebook and Amazon. Amazon's top spokesman, Jay Carney, gave $1,500 directly to the O'Rourke campaign. Carney previously served as White House press secretary to President Barack Obama, to whom O'Rourke has been compared. Brian Olsavsky, the company's financial chief, wrote a check for $2,700 to O'Rourke's 2018 campaign, which is the most an individual can give in an election. Amazon employees, overall, gave $75,751 to his campaign. O'Rourke finished the 2018 campaign having raised $80 million, with 45 percent coming from small donors. The rest came from people giving more than $200, including important players at Facebook and Apple. 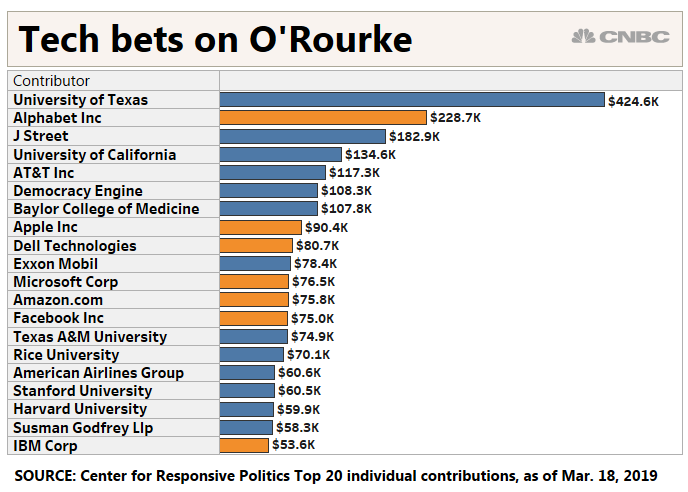 Chris Espinosa, who was designated Apple's eighth employee after the company was founded in the 1970s, gave O'Rourke $2,700. Apple employees gave O'Rourke's campaign just over $90,000 during the 2018 campaign. Alex Stamos, who was Facebook's chief security officer until August, also gave $2,700 to O'Rourke's campaign. Stamos told CNBC that he has not decided whom to support among the Democratic field. But he did say he is advising campaigns on cybersecurity in the wake of Russia's interference and hacking during the 2016 cycle. "One of the great benefits of not being a professional political operative is that I don't have to pick sides 20 months before the general election," Stamos said. "I've been trying to be helpful to multiple Democratic campaigns, and right now my focus is on helping them get their campaign technology stacks set up in a secure manner." He declined to name the campaigns he's helping. It is also not clear whether Carney, Olsavsky or Espinosa would support O'Rourke during the 2020 campaign. Representatives from Facebook, Amazon and Apple did not return repeated requests for comment. A spokesman for O'Rourke did not return an email seeking comment. O'Rourke's 2020 campaign has yet to announce how much of his recent $6.1 million haul came from smaller donations. The Texas Democrat has repeatedly said his campaign will not be financed by political action committees, corporations or special interests. In the run-up to O'Rourke's first big fundraising splash of the presidential campaign, Louis Susman, a bundler for Obama, had been privately making calls to "family and friends" to coax support for O'Rourke, he told CNBC last week. O'Rourke himself was once involved in the tech industry, having founded the internet services and software company Stanton Street Technology Group. Up until the middle of 2017, his wife, Amy, ran the business, which is based in their home city of El Paso. A recent Reuters report, meanwhile, revealed that O'Rourke was involved decades ago with America's oldest hacking group, the Cult of the Dead Cow. Support from people in the tech industry could have downsides for O'Rourke as several of his rivals have taken aim at Silicon Valley. Sen. Elizabeth Warren, for instance, has called for the breakup of big firms, such as Google and Apple. "Today's big tech companies have too much power — too much power over our economy, our society, and our democracy. They've bulldozed competition, used our private information for profit, and tilted the playing field against everyone else. And in the process, they have hurt small businesses and stifled innovation," she said in a blog post. Another 2020 Democratic candidate, Sen. Amy Klobuchar, has called for tighter regulations on tech companies. Trump himself has attacked Amazon and Google. O'Rourke has yet to cite specific policy stances on regulating the tech industry.